On encountering Klue Chenin Blanc 2016 at this year’s Wine Label Design Awards, I have to admit I hadn’t a clue. Sorry, awful joke. The label duly won a bronze award but what of the contents? 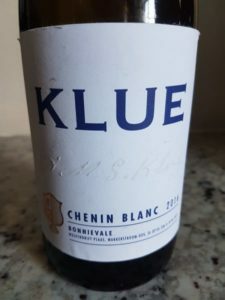 The wine is made by Jan and Michael Klue of Bonnievale farm Wolvendrift as a tribute to their great grandfather Anthon Salomon Michael Klue who arrived in the area in the early 1900s and planted vines in the Wakkerstroom ward in 1929. Matured for six months in second-fill French oak barrels, the wine is pleasantly oxidative in style. Deep yellow in colour, the nose shows stone fruit, honey and an almost mushroom-like note while the palate is rich and smooth textured, tangy acidity lending balance, the finish nicely savoury. Price: R135 a bottle.